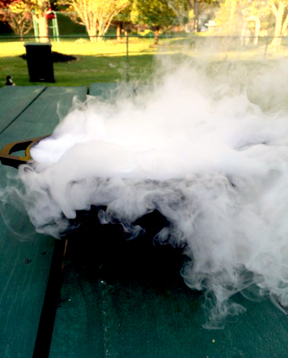 Dry ice is the solid form of carbon dioxide (CO2) – frozen carbon dioxide. It is extremely cold (-109°F) and completely dry. It's called “dry ice” because it doesn't melt into a wet liquid. Dry ice sublimates, going from its solid form directly to its gaseous form (carbon dioxide), bypassing the liquid state. If you’re handling dry ice for the first time, please see our safety instructions. Dry ice is made from carbon dioxide gas. It’s made by compressing carbon dioxide gas until it liquefies to form liquid CO2. 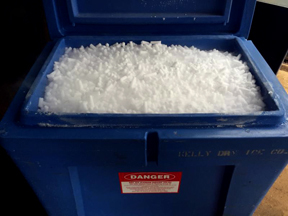 When the pressure is released, some of the liquid will transition into a gas, cooling some of the liquid into dry ice frost or snow, which can be collected and pressed into pellets or blocks. © 2016 Kelly Dry Ice Co., Inc. All rights are reserved.